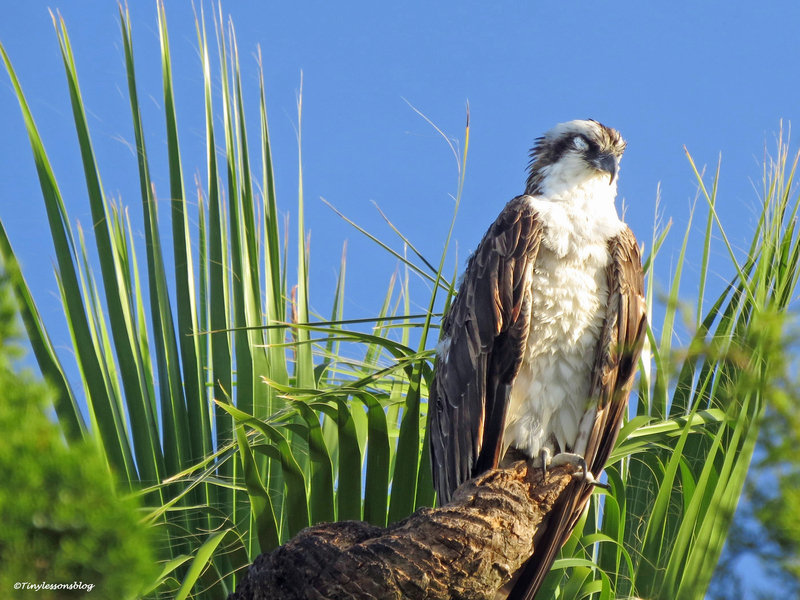 Papa Osprey’s Photo Shoot. 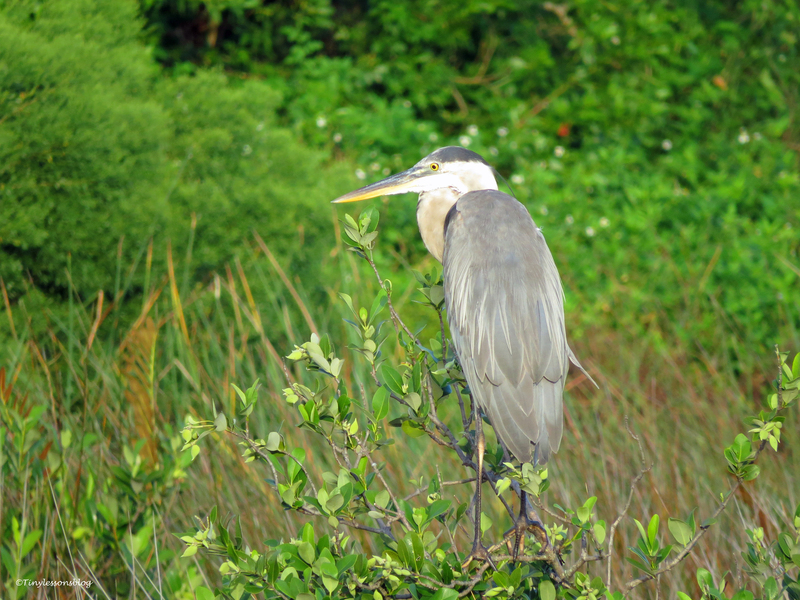 And an Illicit Visitor at the Salt Marsh. The sun was barely up on my first day home after the trip when I stepped out in the garden. Without even a cup of coffee. I just had to go see my feathered friends before starting a busy day. And he was right there. 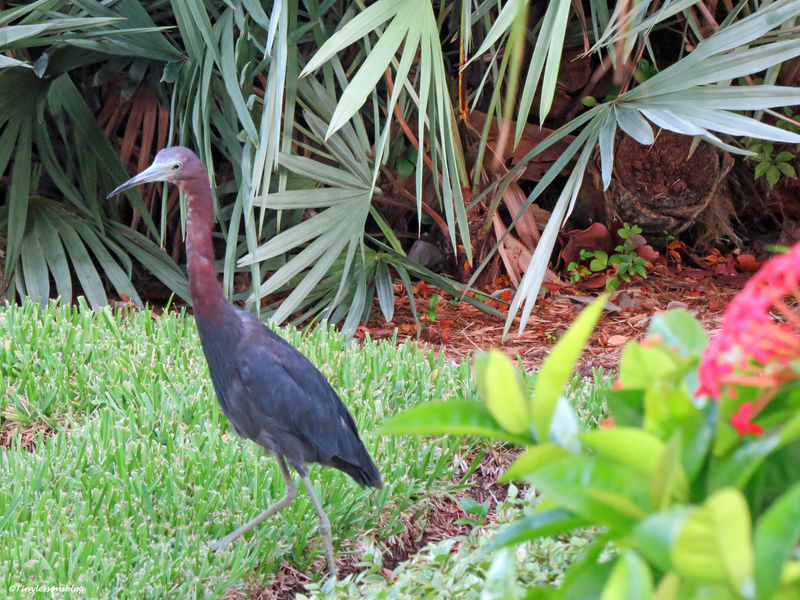 The Little Blue Heron, in a shady spot under the palm trees. It was wonderful to be welcomed home by one of my friends from the salt marsh. 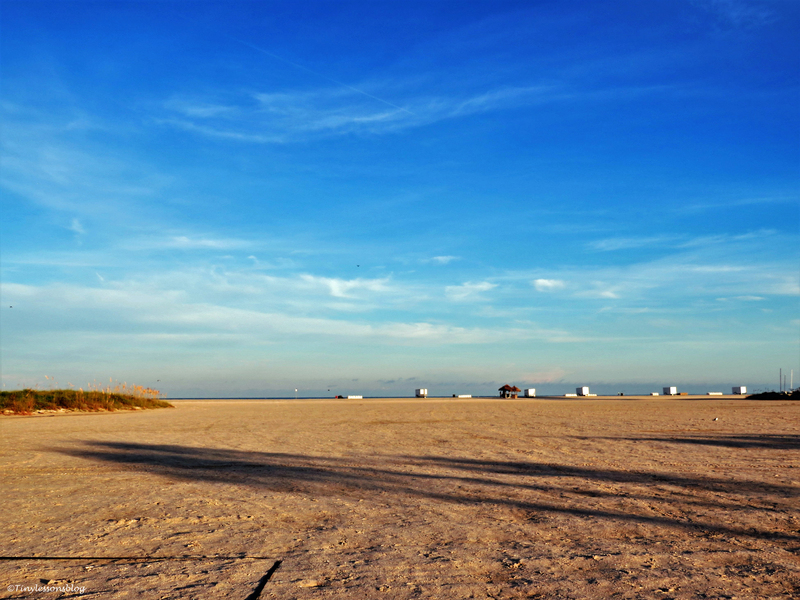 The beach was quiet. And the rainwater “lake” was gone. 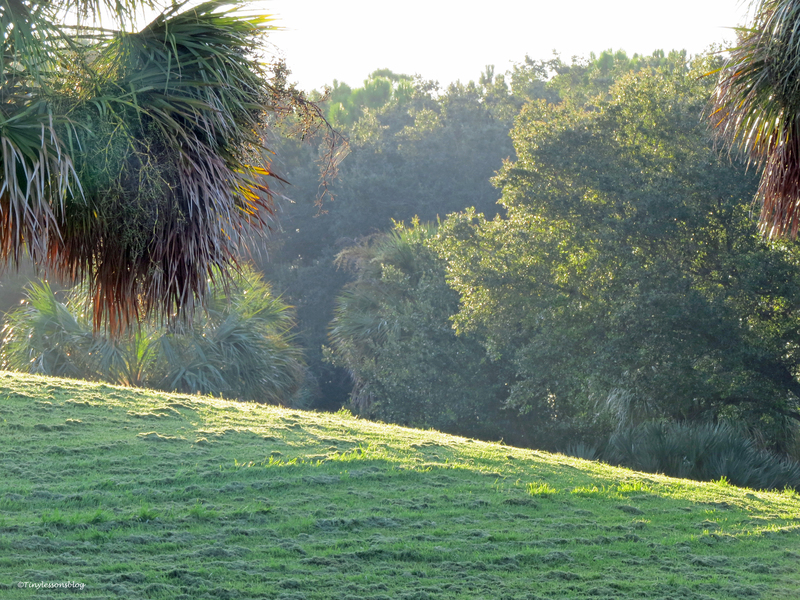 The salt marsh looked fresh and misty. And I saw the water levels were almost back to normal. Little islets stuck up from the water, just as they used to. Most birds were still in their sleeping quarters, but Mama Sandy was already having her breakfast at the nest. She had a nasty wound on her left leg, but looked okay otherwise. When I came closer, she greeted me in her typical straight forward, but friendly manner. I thought she even smiled. 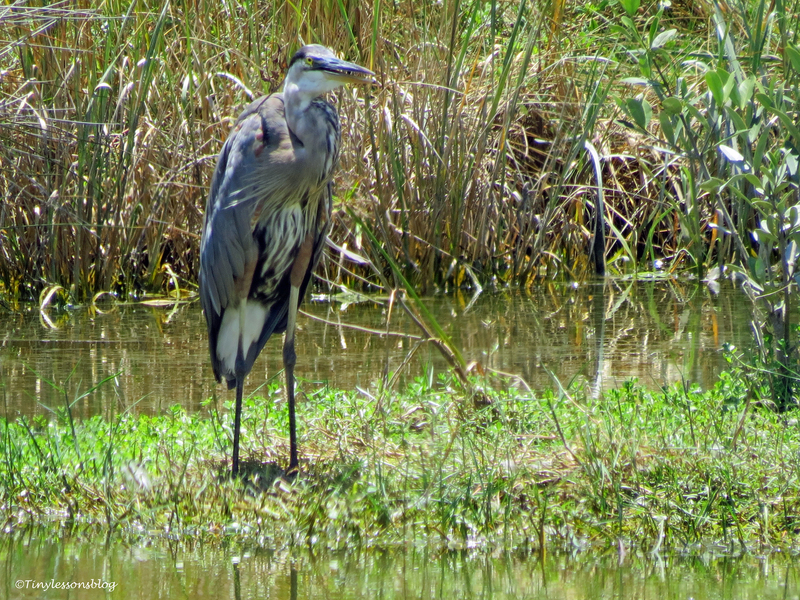 I found the young Great Blue Heron (GBH) close to the osprey nest, as often is the case. He didn’t bother to look at me. 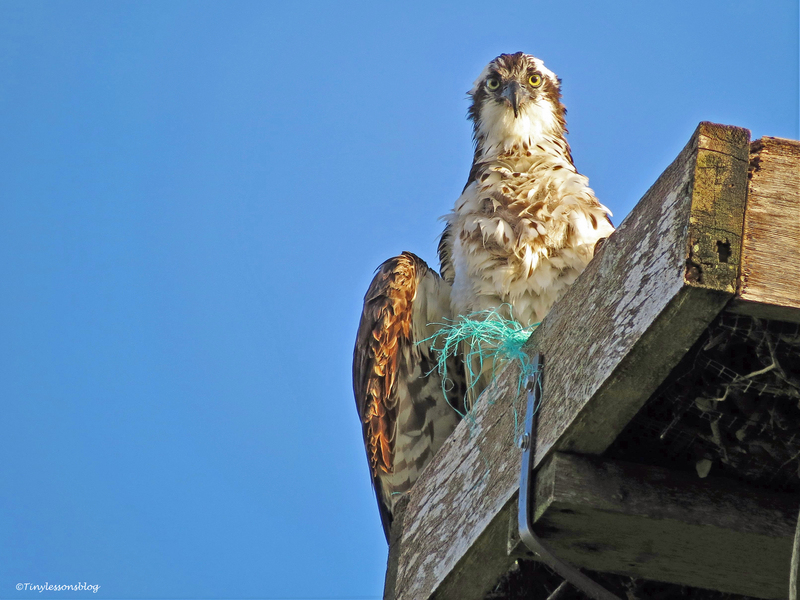 He might be familiar with my view on his attacks on the nest earlier this year. 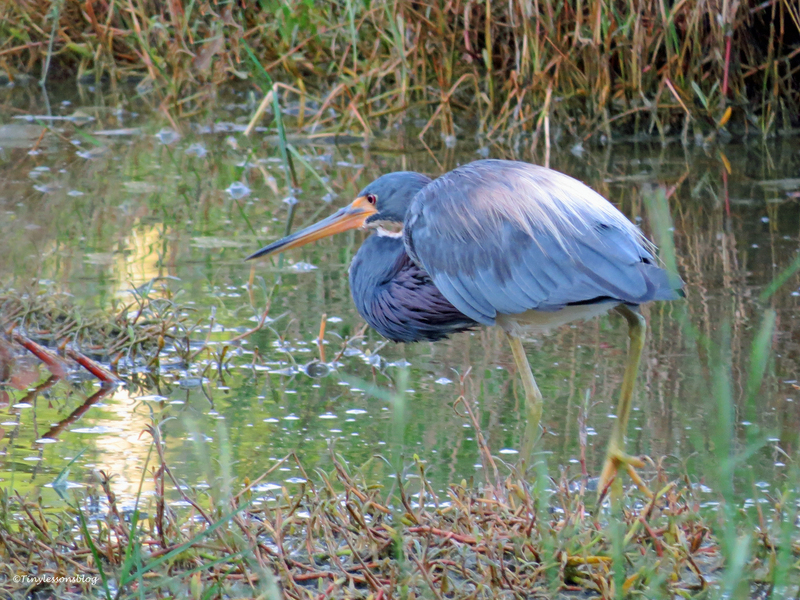 The Tri-colored Heron, who had temporarily moved elsewhere during the floods, was back home. She was happily hunting for her breakfast in the shallow waters. I continued my walk to the bay side, and marveled at the European Starlings greeting the sun on a lamp-post next to the park. I decided to check if Papa Stanley would be at his resort. He was at home. Still sleeping when I arrived. He soon discovered me and decided to pose for a photo shoot. A rare treat, and so very kind of him. I thought he was quite handsome. That was a great home-coming. I got another opportunity to get out for a quick walk this morning. 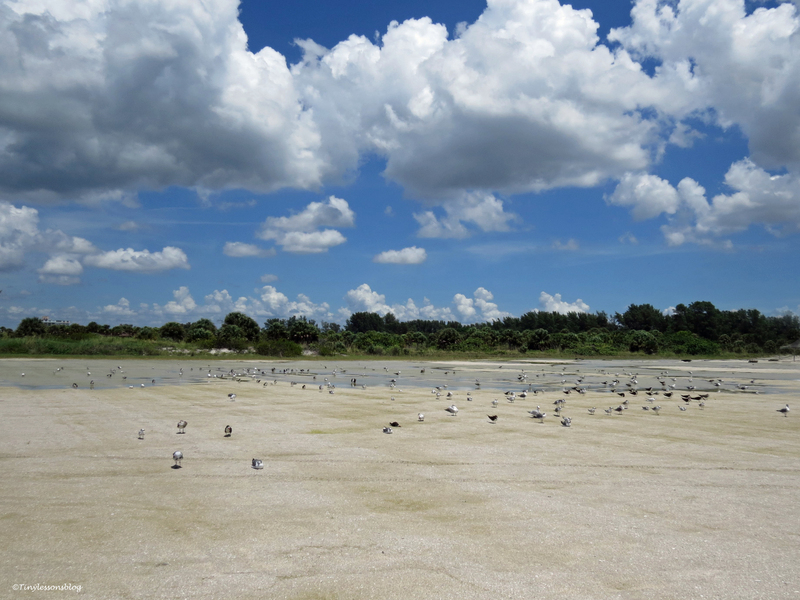 I discovered that the “beach lake” had reemerged after yesterday’s short, but intense storm. Many birds were enjoying rainwater baths and the special menu the fresh waters had to offer. 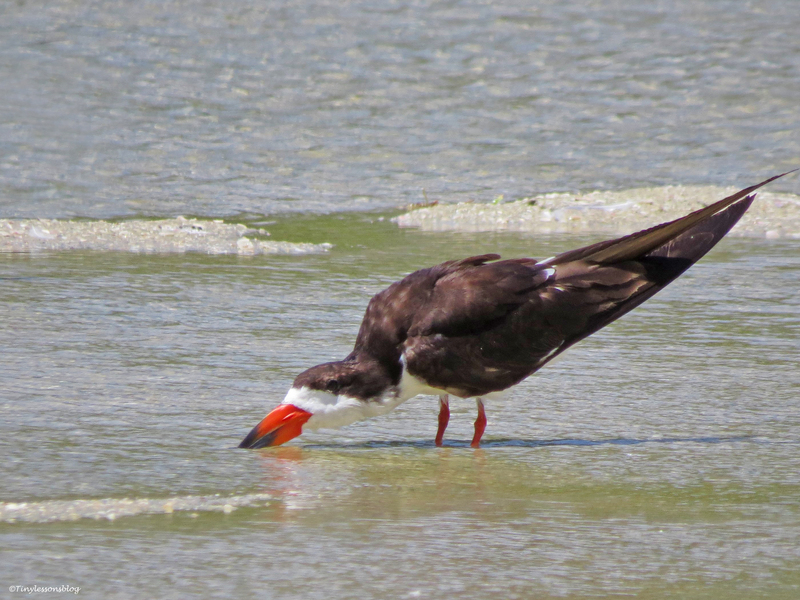 And some, like this juvenile Black Skimmer, were just plain tired of all the excitement. 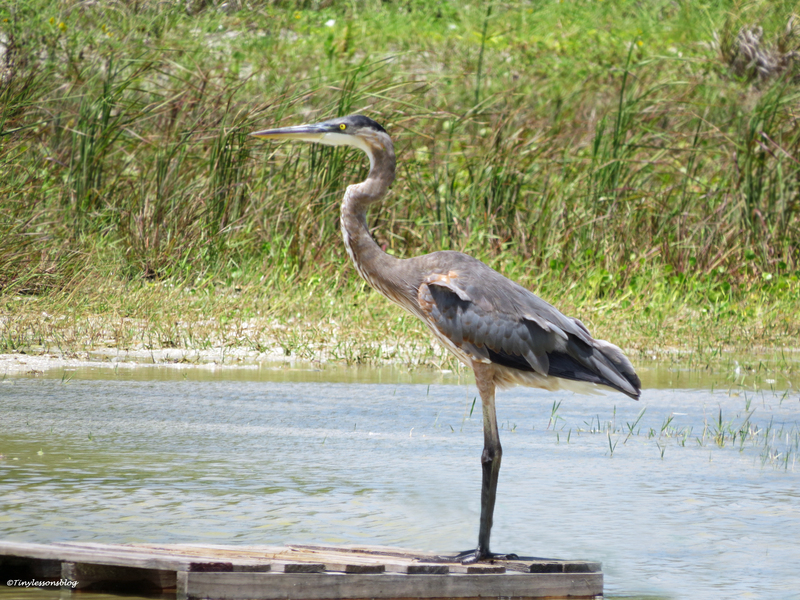 While the young GBH was frolicking at the “beach lake”, the older one, the Mayor, was back in charge at the salt marsh. I bet he was not happy to see this illicit fisherman trying to capture the fish that belongs to the residents. I was not happy either. I wished Sandy had been at the nest and given him a small lesson. But luckily, as soon as I started walking towards the park HQ, he packed his gear and left. 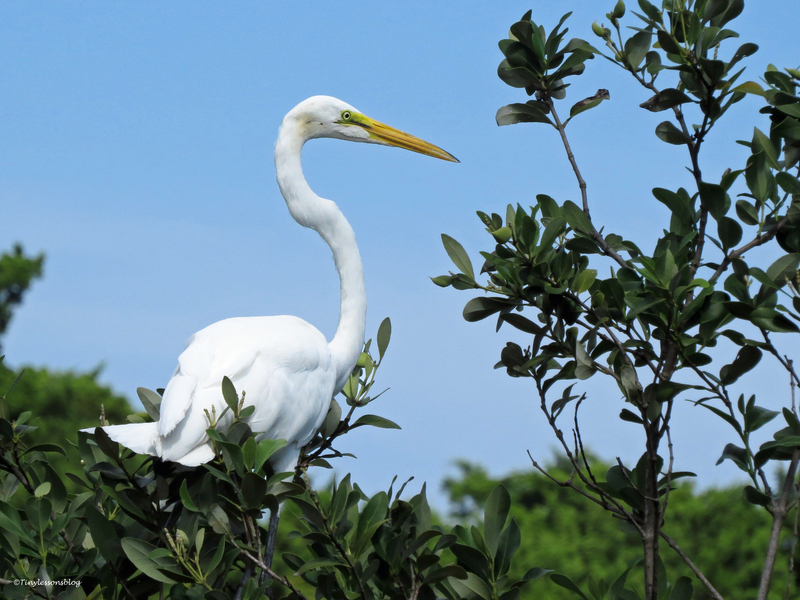 Once he was gone, I came back to greet the Great and Snowy Egrets who were enjoying the sunshine in large numbers, and then walked back home. So much excitement, as always, at the salt marsh. Thank you for coming along. We all wish you a wonderful weekend! I love your world, Tiny! 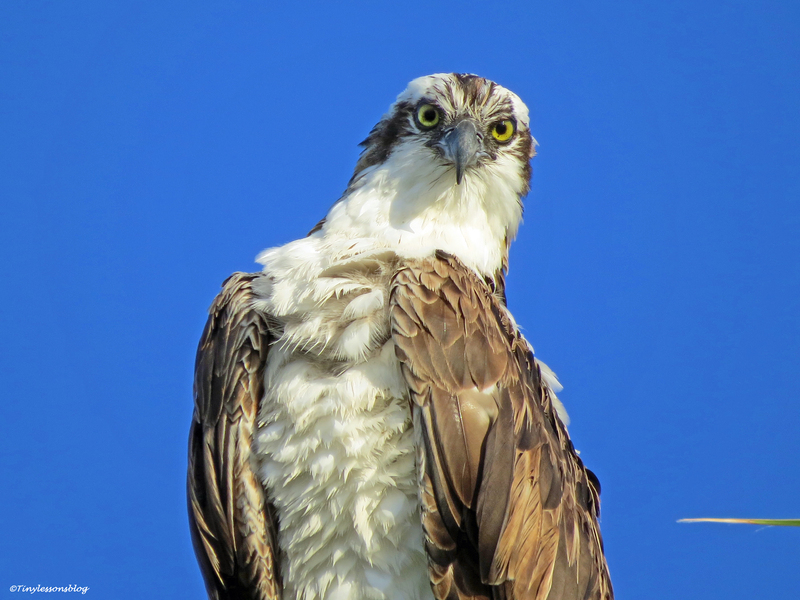 And Papa Osprey was surely showing off for you..priceless! Thanks Susan! These birds are a lovable bunch 🙂 And Papa Osprey looks really rested now, six weeks after the last “kid” left home. I’m so touched by seeing how Mama Sandy and Papa Stanley recognize you and even pose for you. 🙂 Beautiful capture of these bird. The first shot of the water and sky is stunning! I’ve been watching Sandy and Stanley for about 20 months now…so we’ve learned to know each other 🙂 In the early days they flew away if I stayed too long or stood too close, even gave short alarms when they had a chick last year, but not any more. Thanks Amy! Loved the tour. You have such great details in your photos, and I always enjoy the stories. I’m learning so much along the way. Happy you came along for the tour, Cyndi! I’m learning so much all the time, there’re interesting things going on in the bird-world. Your comment made me smile, Hien. So glad the fisherman left! Some people have no respect. I think Papa is enamored of you. 😉 I believe he was flirting! ha! 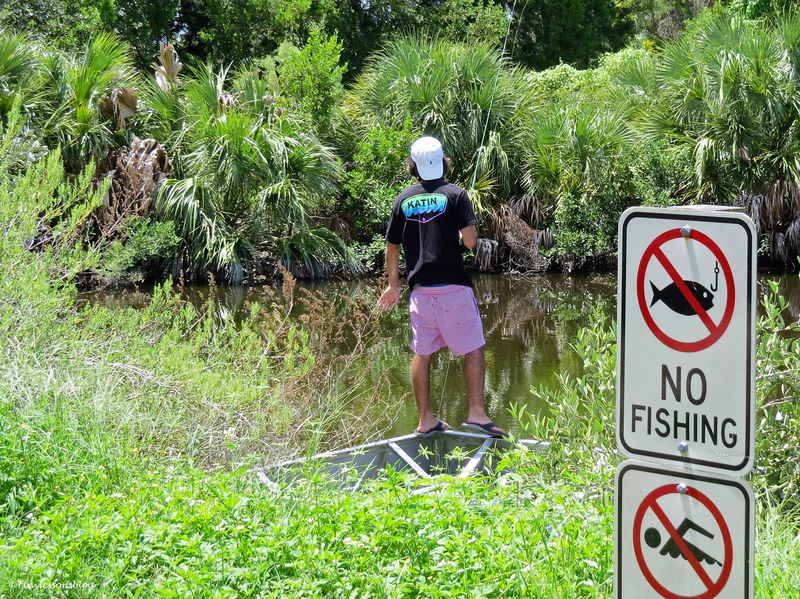 Hahaha…he was just trying to pose nicely so I could get my photos quickly and go away 🙂 The guy fishing just beyond the “do not fish” sign would have gotten a hefty fine if caught by my friend, the female ranger at the park. And he knew it. Just had to do it because he could. What a welcome back party! Awesome photos as always Tiny. 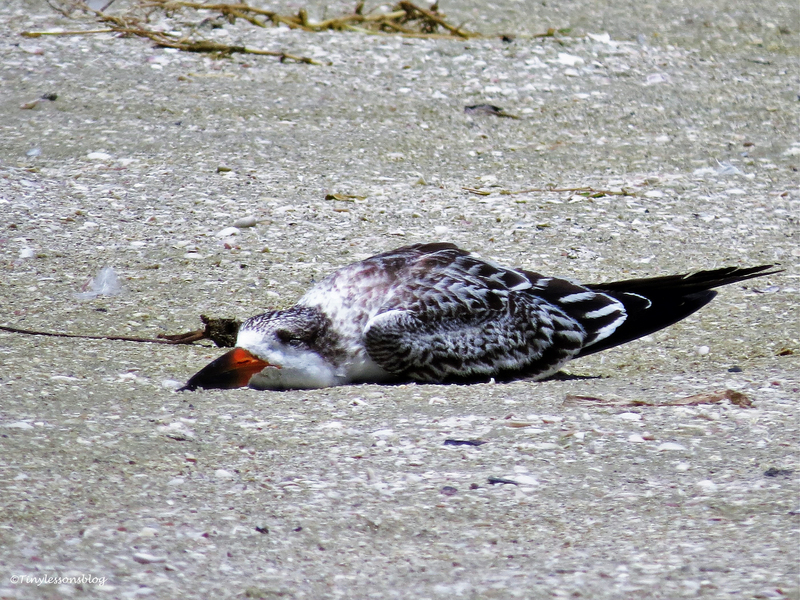 I e never seen a bird laying down like that! Too funny! At first I also thought you were posting a dead bird pic lol. Hehe…wouldn’t do that. I think their bill is quite heavy so it’s more restful to sleep like that. That just my theory. Oh that’s a good deduction. Very possible! So many great Birds Tiny, just wonderful. Thanks Leanne, happy you enjoyed them. How joyous for you to see all your friends again at the Salt Marsh – and for them to see you too 😊 On close inspection of your photos I saw a few smiles on their faces… Hope you have a great weekend Helen! Oh, it was great to see them all again. And yes, I think some of the smiled 🙂 It’s funny how I’ve learnt to know many of the birds who reside there and can now tell them from visitors. 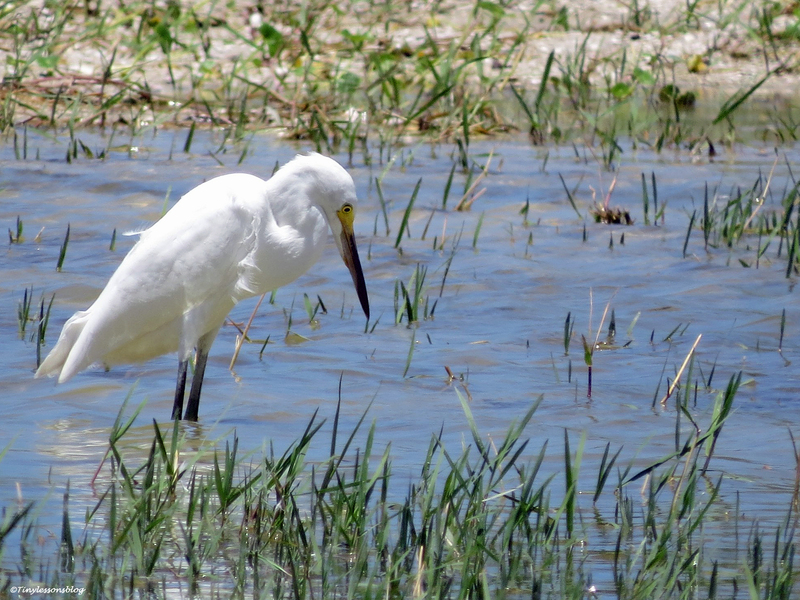 But egrets are impossible to distinguish…they all look the same. Have a great weekend, Kathy! What a wonderful post of so many of your bird friends. 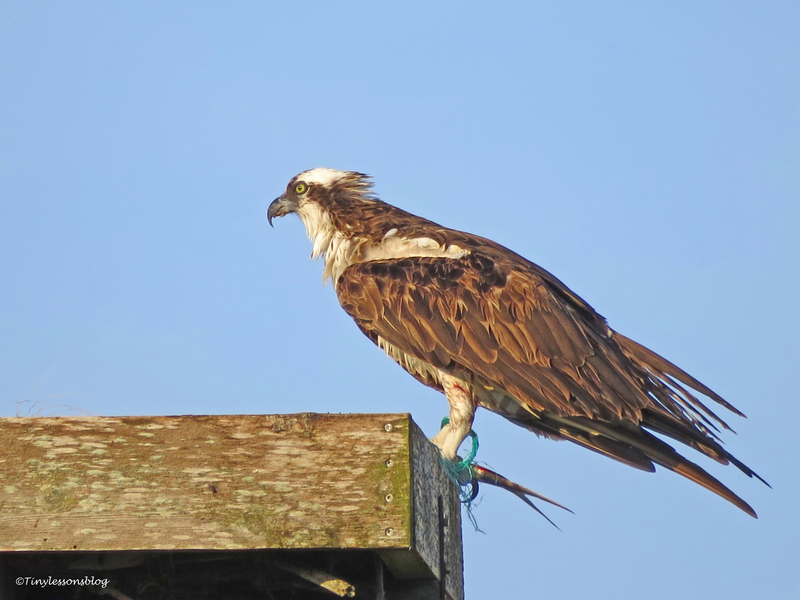 I particularly enjoyed Papa Stanley posing for you, what a majestic bird. I thought the fisherman was very cheeky and was glad that he packed up when he was observed. Happy you enjoyed our friends, Susan. Papa’s posing was great, I got several more pics but didn’t want to load too many here. He was very patient. I was going to tell my friend, the Ranger, to come and ticket the fisherman, but he knew he’d get fined as this is a protected park, and left quickly. How wonderful Tiny to have all this virtually in your back yard, what a beautiful place to return to. 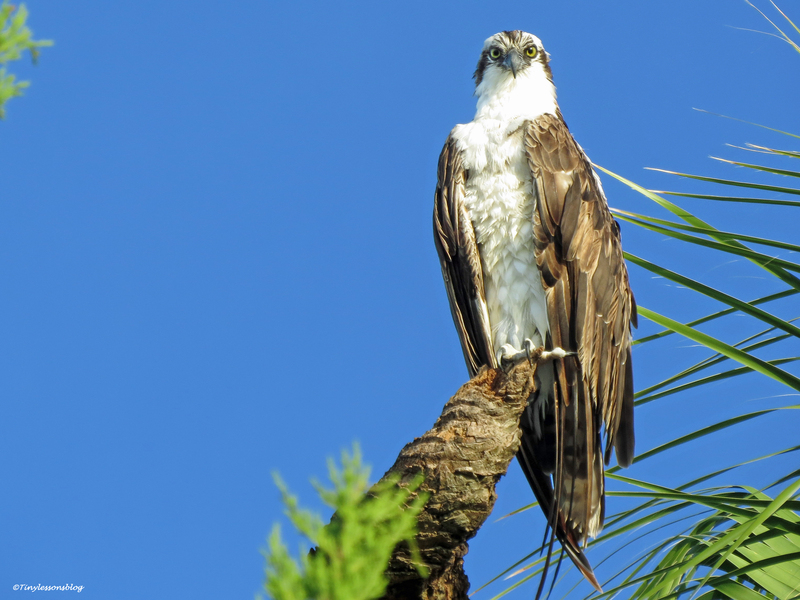 Your pictures are excellent, and Papa Osprey did posed with a dignified stance. 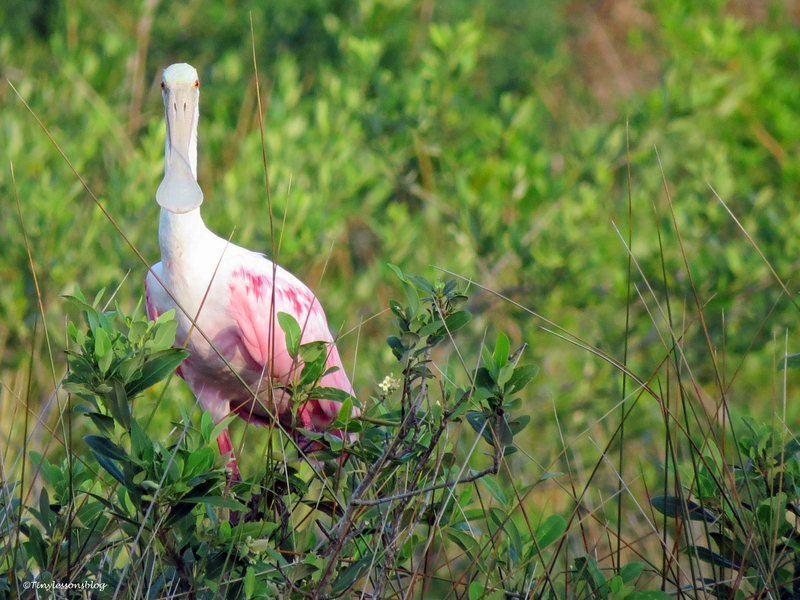 You really have some beautiful waterbirds to share. Thanks again, I love your posts! Thanks Sylvia! 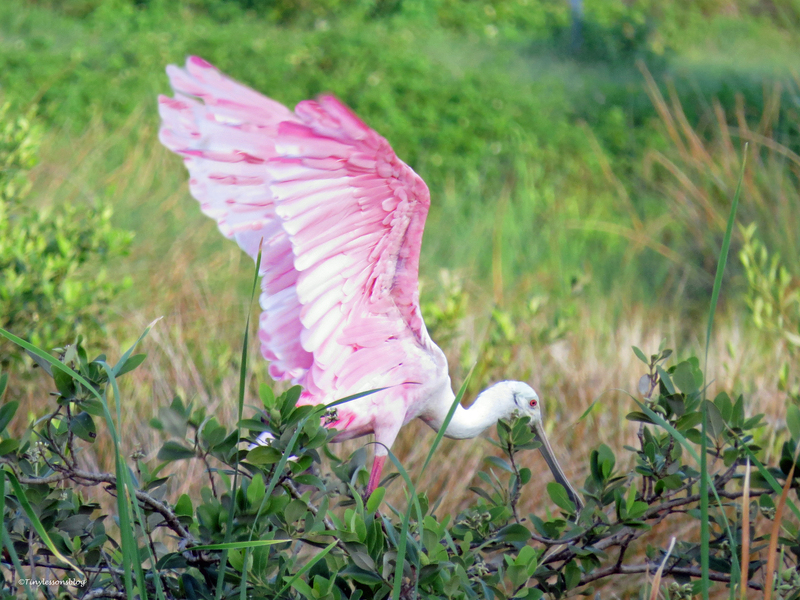 I wish we could organize an one way ticket for a couple of the many Spoonbills that live on the small bird island in the bay. They come to visit Miss Rosa at the salt marsh from time to time 🙂 Have a beautiful weekend! Sandy was definitely smiling, Stanley was definitely hamming it up and that fisherman is an idiot and I am glad he left. I almost asked the fisherman if he can read, but kept my mouth shut after remembering my martial art skills are quite rusty by now. He’d been fined had my friend, the Ranger, been there. But happy he left quickly. I remember Sam the Eagle…and yes, Papa sounded a bit similar when instructing me to shoot his different poses. I enjoyed the tour as always! Thanks for coming along, Nancy! Thank you! Happy you’re not tired of this little cast of characters, H.J. 🙂 Tuesday morning I saw a new bird, still trying to identify it. Its like a gathering of the clan!! Love your captures Tiny – from the establishment to the youngsters! What a wonderful environment to have near your door and what good use you have made of it to serve up another treat for us. Thank you! These birds at the salt marsh always have some stories to tell, happy you enjoyed it. Lovely, wonderful pictures! Rosa is so pretty and the photo shoot with Stanley was amazing! I always enjoy and appreciate your walks. Thanks Barbara. I was just thinking that I didn’t see Rosa that day when she flew in and made my day. Stanley was in good mood, unusually cooperative, and posing nicely… That was fun! These were great pictures. I know they are not the most spectacular of birds, but I really like the shot of the European Starlings. They’re such a friendly, gregarious-looking bunch! It cheers me up to see them. I like the starlings as well. 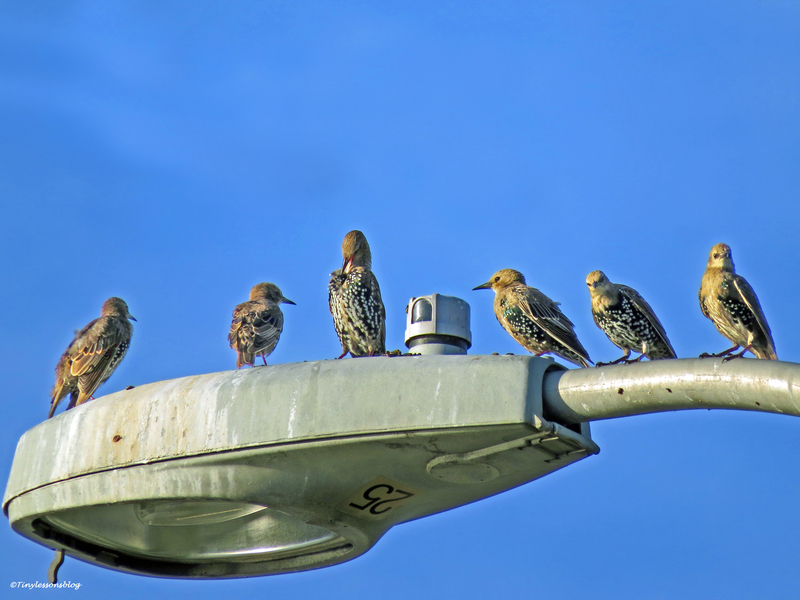 One time I caught 14 of them worshipping the sun on a similar lamppost – a tight fit. That sounds about right for starlings! It’s lovely to be home again, isn’t it? 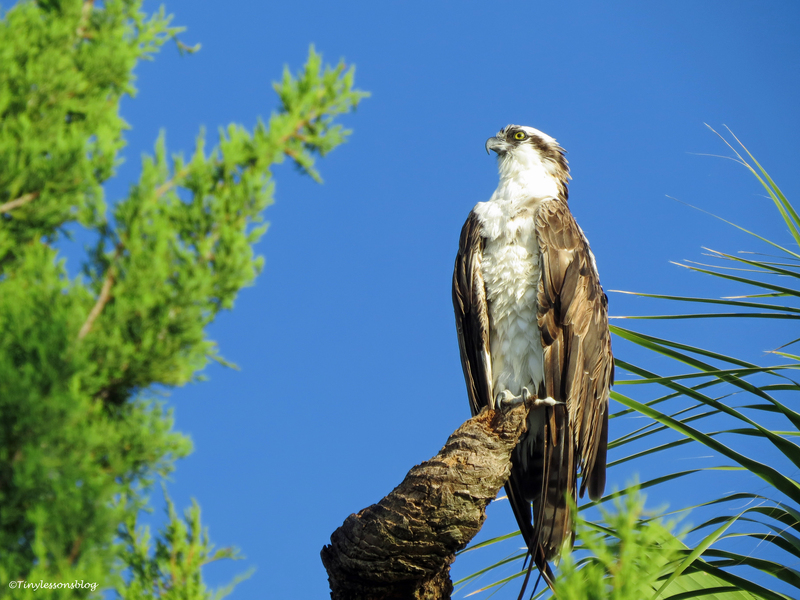 All the birds are beautiful but Papa Osprey is magnificent. Do hope Mama Sandy’s wound heals up.Would the ranger help if the wound began to trouble Mama Sandy or is nature always left to take its course? I was worried about the wound, particularly as I had not seen Sandy for a couple of days when I checked on them with my binoculars. So this morning I finally got out again, but didn’t see any trace of Sandy… or Stanley. That is until I was on my way home. I happened to look up at Marriot’s roof – and there they were, Sandy on the first roof level and Stanley on the top. Phew. Sandy seems okay, but more on that later this week. If the wound had been infected, and she would appear sick, the ranger could have taken her to the sanctuary to be cared for and then released back at the salt marsh. Oh that’s good to know there is a sanctuary for them, if need be. That’s the place I visited a few months back, and it’s not far from here. The trickiest part is to capture a bird that needs care. And I can imagine an osprey would not come quietly. No – unless she’d be very weak, and even then a hard hat would be necessary. But my friend rescues birds several times a week…somehow she does manage. Your bird family missed you! So happy to see the Salt Marsh family & friends doing well. 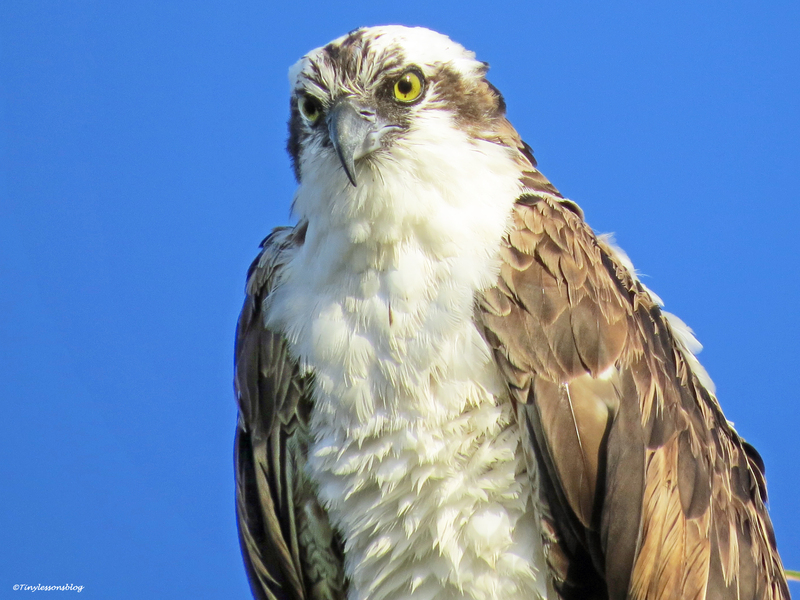 And Papa Osprey looks so handsome indeed. I think he knew he was being admired (like most males) 😀 Wishing you a great week ahead! Oh, I think you’re right about Papa Stanley 😀 Everyone seems to be doing well, and it was great to see them again. Happy you came along to say hi to them. Have a wonderful week Takami! Yes, I’m sure that is a smile on Mama Sandy’s face… Maybe you scared away the fisherman… that’s a great photo with him right next to the sign! Thanks! I’m not that scary 🙂 but I think the guy saw me taking his picture and then walking towards the HQ where the ranger is…so he got into hurry to leave.